In this short section discussing cavitation, I have, to date, described what it is and the normal method for determining cavitation resistance, and some of the damage that can come from unexpected cavitation in civil construction. Most efforts are directed at suppressing cavitation, since it can do a lot of damage and cause machines to fail. However, for those of us who work in excavation and cutting, finding ways to exploit cavitation and enhance the damage it causes can be productive. The initial paper, that I am aware of, written with this suggestion was presented at the First International Symposium on Jet Cutting Technology (ISJCT) by Johnson, Kohl, Thiruvengadam and Conn “Tunneling, Fracturing, Drilling and Mining with High-Speed Waterjets Utilizing Cavitation Damage.” The paper was given in 1972, and one of the demonstrations that came out of this was of a small jet, at relatively low pressure, drilling a hole through a brick. 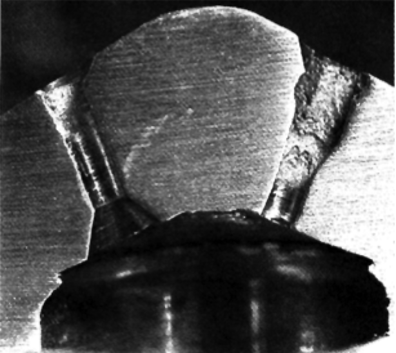 The penetration rates reported in that paper were relatively low in comparison with conventional tools, but with a jet pressure of 2,000 psi and diameters of up to 1/8th inch, the hole could not be made without cavitation assistance. The early nozzle designs were designed to induce cavitation bubbles in the center of the jet stream. Cavitation is created by developing shear or tensile forces in the water. 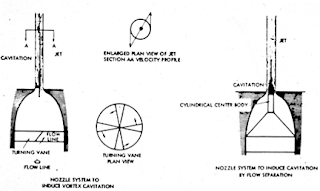 In the left-hand part of figure 1 the jet is spun so that a vortex is generated in the flow as it enters the narrowest part of the jet. This creates the bubbles that are then carried down-stream in the center of the jet flow, and hopefully collapse at the target surface. Perhaps the most advanced versions of this concept were later used by PetroPhysics, a company based in the Bay area of California. 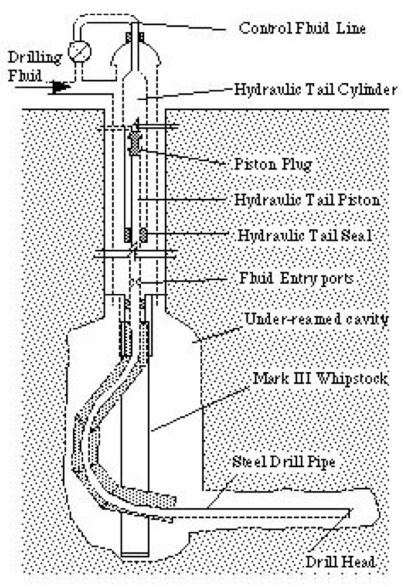 The Dickinson brothers used the aggressive, but spreading, jet coming from the orifice to clean oilwells and to allow them to drill holes into rock, without needing to rotate the nozzle assembly. The nozzle was a little more advanced than the initial design, but the jet had to drill a larger diameter hole, if the nozzle assembly was to follow the jet into the rock. The great advantage of this tool was that, because it did not rotate, it could be used to drill long-lateral wells from the bottom of an existing oilwell out into the oil-bearing rock. This will significantly improve the penetration rate in many wells. (On a word of caution - there are other companies that claim to be able to do this, but some of them have less credibility than others, since the use of hose as a feed pipe means that the hose can fold up in the main well, suggesting that the bit is drilling, when it is not – there should be lots of cuttings and fine rock in the hole (making it more difficult for the drill to advance) if the drill is actually working). Figure 3. 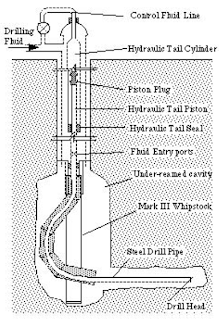 Schematic of the PetroPhysics drilling concept. Part of the problem with this system lies in the difficulty in ensuring that the hole diameter is of consistent size. When, in other work, we used a waterjet to drill a long horizontal hole, several hundred yards long, we found that the jet tends to preferentially cut at the bottom of the hole. If this is not built into the design (by tilting the nozzle up an adjustable amount) then it becomes very difficult to ensure that the hole runs straight, instead of curving increasingly downwards (and thus out of the target rock). Yet (though I never saw it work) it was reported that the drill was able to drill quite successfully in granite in California. This design gave a broad path for cutting, and we were looking to provide a highly focused cutting stream, so the design suggested in the right-side of figure 1 seemed more attractive, and perhaps easier to construct. One of the thoughts in choosing this was that, as the jet hits a target, the reverse flow on rebound will protect the surface from some of the bubbles, whereas if the bubbles are in the center of the jet, then that lateral flow will force collapse against the surface. Figure 4. The rebounding jet can protect the target from the collapse of cavitation bubbles, or focus their collapse if they are in the center of the jet. 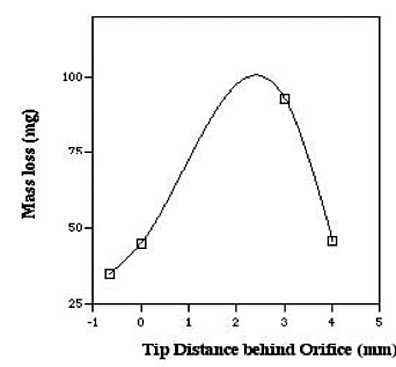 But if a small, flat-ended probe is placed in the right place within the nozzle, then the flow of water past it will induce cavitation in the center of the stream, which is the object. Figure 5. Sketch showing the location of the centerbody within the nozzle. Note that the centerbody has to be back from the front of the orifice. The reason for this is that if it is not, then the vacuum pulled on the tip will be sufficient to drag air through the jet, so that all the probe will do is break the jet into droplets. (And we can prove that isn’t the case otherwise, as I will describe next time). Figure 6. Relative change in erosion power of the cavitation as a function of the distance from the front of the tip to the face of the nozzle. Even without this central probe in the nozzle it is possible for cavitation to occur, and bubbles to collapse, within the nozzle body. Doug Wright of StoneAge has shown that this can be quite severe, degrading nozzle performance significantly. The simple designs that we used, pins held the parts together for alignment, allowed us to cavitate a waterjet at pressures up to 20,000 psi, at which the resulting stream drilled through a piece of alumina held close to the nozzle, and was able to drill (at a pressure of 6,000 psi) out more than 18-inches from the nozzle into dolomite. Figure 8. Titanium probes showing the flow passages and the probe itself. Note the progression of cavitation damage at points on the probe. These caused the tip to break off after runs of several minutes. Although there is a great potential for further development, this area of development fell into disuse, partly because of the power that can be generated and used for other purposes, and I will discuss those, next time.